Taiyou’s signature monsters have their new effects revealed! 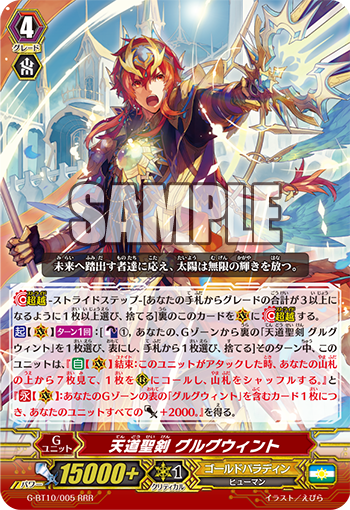 ACT (VC) 1/Turn: [Counter Blast 1 & Choose 1 face-down “Holy Sword of Heavenly Law” from your G Zone, flip them face-up & Choose 1 card from your hand, discard it] During that turn, this Unit gains “AUTO (VC) Unite: When this Unit attacks, look at the top 7 cards of your Deck, Call 1 card to (RC), then shuffle your Deck.” and “CONT (VC): For each face-up “Gurguit” card in your G Zone, all of your Units gain Power+2000.”. CONT (VC) GB2 Unite: All of your Rear-guards gain “Intercept” and “CONT (RC): During a battle in which your Vanguard is attacked, this Unit can Intercept from the Back Row.”. AUTO (VC): [Counter Blast 1 & Soul Blast 1] During your turn, when your G Unit [Stride]s, you can pay the cost. If you pay it, look at the top 4 cards of your Deck, Call 1 of them to (RC), and if you called a Unit with the Unite ability, look at the top card of your Deck, and Call it to (RC) at Rest. For Today’s Card, we’re introducing from the 10th Booster Pack “Raging Clash of the Blade Fangs” (on sale February 3rd, 2017) are the 《Gold Paladin》 RRRs, the 【Unite】 super ace G Unit “Holy Sword of Heavenly Law, Gurguit” and the new Grade 3 Gurguit, “Golden Holy Sword, Gurguit”. “Holy Sword of Heavenly Law” drawing on the all ally enhancing ability of “Sunrise Ray Radiant Sword, Gurguit”, is a G Unit that strengthens your allies even if it’s your first Stride!! For each face-up copy of a “Gurguit” in your G Zone, all of your ally Units gain Power+2000. And when you attack, you can look at the top 7 cards of your Deck and call 1 to a Rear-guard Circle. This ability means even if it’s your first Stride, all of your allies gain Power+2000! On your second Stride, all of your allies can gain Power+6000! And not only does “Holy Sword of Heavenly Law” gain Power, but all of your Rear-guards’s attacks will be more sure to hit. And when you Call “Knight of Spring’s Light, Perimore” during an attack, you’ll be able to increase your columns. Its Power up ability is also a Continuous ability, meaning regardless of the timing when you Call, during that turn it’s gonna be gaining Power. Its ability to place checkmate on the opponent is incredibly high, meaning it can place incredible pressure on the opponent. “Golden Holy Sword, Gurguit” is a card with outstanding affinity with the 【Unite】 ability. It’s Stride Skill allows you to look at the top 4 cards of your Deck, Call 1 of them to your Rear-guard Circle, and if the Called Unit has the Unite ability, you can look at the top card of your Deck, and Call it to a Rear-guard Circle at Rest. It’s a wondrous ability that allows you to fulfill the conditions of 【Unite】 with just your Stride Skill. And if you’ve achieved Generation Break 2 & Unite, regardless of Front Row or Back Row, all of you Rear-guards will be able to Intercept when your Vanguard is attacked. Similar to “Sunrise Ray Knight”, its ability to let you Guard is incredible! The defensive iron wall ability of “Golden Holy Sword, Gurguit” and the smashing force of “Holy Sword of Heavenly Law, Gurguit” both allow you to aim for victory!